A comprehensive overview is given in this book towards a fundamental understanding of the micromechanics of the overall response and failure modes of advanced materials, such as ceramics and ceramic and other composites. These advanced materials have become the focus of systematic and extensive research in recent times. The book consists of two parts. The first part reviews solids with microdefects such as cavities, cracks, and inclusions, as well as elastic composites. 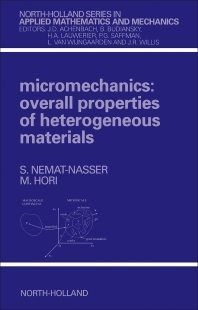 To render the book self-contained, the second part focuses on the fundamentals of continuum mechanics, particularly linear elasticity which forms the basis for the development of small deformation micromechanics. In Part 1, a fundamental and general framework for quantitative, rigorous analysis of the overall response and failure modes of microstructurally heterogeneous solids is systematically developed. These expressions apply to broad classes of materials with inhomogeneities and defects. While for the most part, the general framework is set within linear elasticity, the results directly translate to heterogeneous solids with rate-dependent or rate-independent inelastic constituents. This application is specifically referred to in various chapters. The general exact correlations obtained between the overall properties and the microstructure are then used together with simple models, to develop techniques for direct quantitative evaluation of the overall response which is generally described in terms of instantaneous overall moduli or compliance. The correlations among the corresponding results for a variety of problems are examined in great detail. The bounds as well as the specific results, include new observations and original developments, as well as an in-depth account of the state of the art. Part 2 focuses on Elasticity. The section on variational methods includes some new elements which should prove useful for application to advanced modeling, as well as solutions of composites and related heterogeneous bodies. A brief modern version of elements in vector and tensor algebra is provided which is particularly tailored to provide a background for the rest of this book. The data contained in this volume as Part 1 includes new results on many basic issues in micromechanics, which will be helpful to graduate students and researchers involved with rigorous physically-based modeling of overall properties of heterogeneous solids.